On the northeast corner of our lot sits our kitchen garden. A big fig tree, twice as tall as I, spreads out like a long espalier on its west side. The garden, roomier than a modest but nevertheless pricey one-bedroom apartment in the city, has two raised beds made of cinder blocks, strawberry troughs, and wine barrel planters. 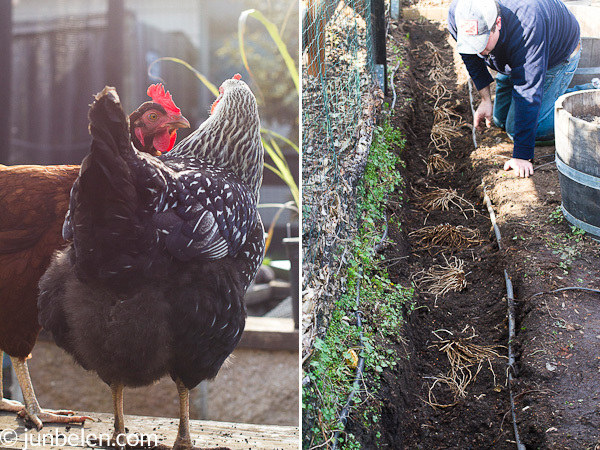 Everything is fitted with drip line irrigation — a nifty must-have for any serious urban farmer, in my opinion. A tall deer-proof fence secures the garden all around. Oakland’s hills are teeming with wildlife. We’ve seen a fox strutting down our street twice already since we moved. A flock of wild turkeys pays our block a visit every now and then. If we don’t keep them out, deer will turn our lettuce and tomato beds into a free-for-all eat-all-you-can salad bar. Nobody lived in the property for a while before us and so everything in the garden and around the yard was heavily overgrown when we moved in. The mailbox, for instance, looked like it was swallowed by the juniper tree standing unwieldily next to it. It’s been four months since we got the keys and we’ve been busy working around the house. Trimming overgrown oleander and juniper trees. Taming wild ivy vines and blackberry bushes. The Golden Girls have been hard at work, too. Weeding out grass and tearing up fallen leaves. Stirring up the soil. Aerating it and enriching it with their nitrogen-rich manure. We’ve been busy planting, too. Asparagus and rhubarb along the perimeter across the fig tree. Lemongrass. A three-year-old Meyer lemon tree. Bare-root Quinalt and Albion strawberries. Broccoli and sugar snap peas. Swiss chard and fennel. Red and green leaf lettuce and leeks. Black Krim, New Girl, and San Marzano tomatoes. All from seeds. The list of to-do’s goes on and on. I’m not even counting the orchard and the backyard bees, which are projects that, I’m afraid, will have to wait another year. Our plate is full and there’s plenty to do. But nothing makes me happier these days than knowing that the days are getting longer. That the days are getting warmer — knock on wood! Daffodils and paper whites have sprung up. Our pluot tree is abloom. Soon I’ll be stir frying chop suey [chap sooy] with broccoli crowns and snap peas picked from our kitchen garden. Soon I’ll be canning tomatoes for sauce. Soon I’ll be juicing calamansi and pickling carrots for sawsawan. No more frost, I hope. I’m keeping my fingers crossed. Whisk fish sauce, soy sauce, oyster sauce, brown sugar, flour, and shrimp stock together in a small bowl and set aside. Bring 1 quart of water to a boil in a saucepan over high heat. Add broccoli and cauliflower and cook, stirring 1 minute or until broccoli is bright green. Drain in a colander and set aside. Heat a large heavy skillet or wok over high heat and add 1 tablespoon vegetable oil. Add garlic and stir fry until lightly browned. Add shrimp and stir fry until cooked. Transfer shrimp to a bowl and set aside. Add remaining 2 tablespoons vegetable oil. Add onions and stir fry until fragrant and soft. Add carrots and mushrooms, stir fry until mushrooms begin to soften. Add sauce, cover, and cook, stirring occasionally, until carrots and mushrooms are cooked. 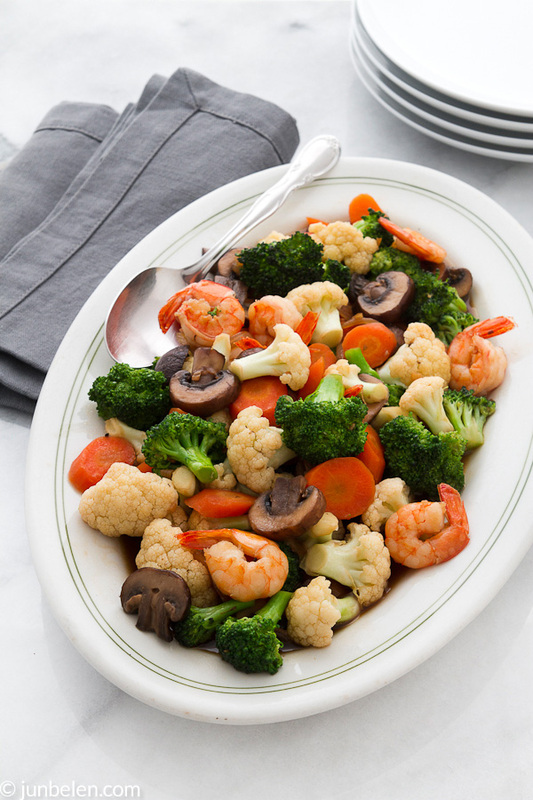 Add shrimp, broccoli, and cauliflower. Stir fry until well combined. Use whatever vegetable is in season. 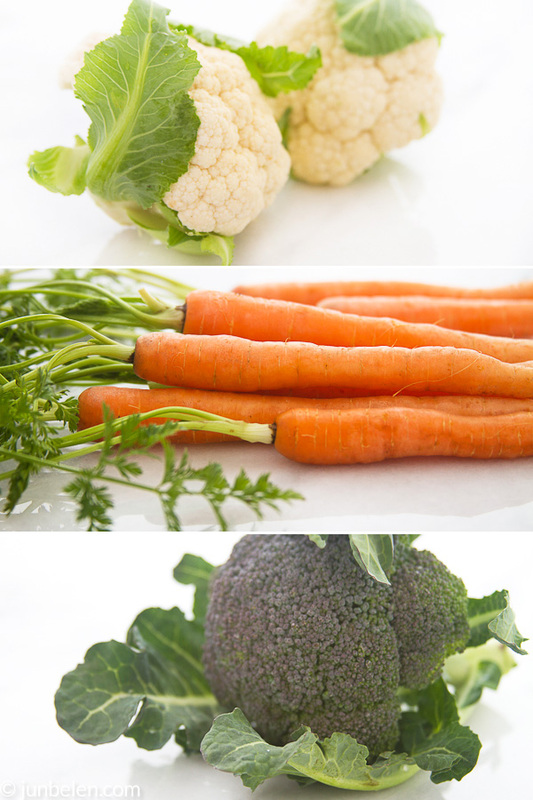 Carrots and cabbages, broccoli and cauliflower year-round. Asparagus and sugar snap peas in the spring. Green beans in the summer. Brussel sprouts in the fall. 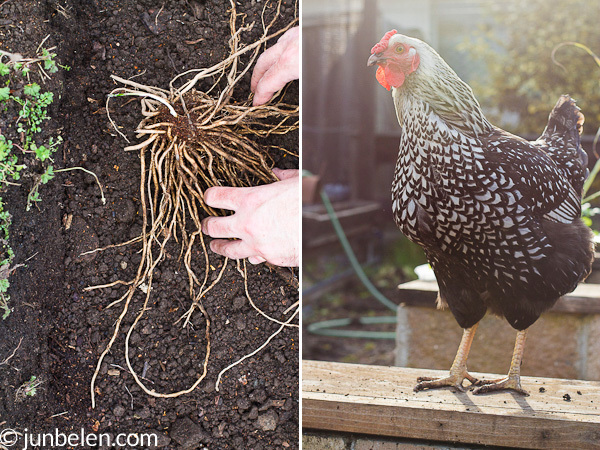 I’m having serious garden (and chicken) envy right now! 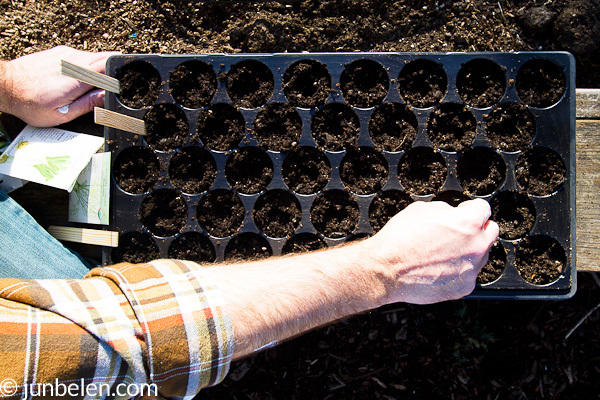 It sounds fun to get your hands dirty and reap the rewards soon. What a treat! Sounds like you are building a lovely home! I’d love a Meyer lemon tree, too. So great to hear about your garden getting fitted up and fixed up! Sounds like you almost have a mini-ecosystem with the chickens. All you need is a compost pile and maybe a goat?! You’re right that there is something very satisfying about having and tending your own garden! Goats? Goat milk? Goat cheese? Oh my! We’ve thought about raising goats at some point but decided it will be a much bigger commitment than raising chickens or backyard bees. Someday, I hope. Someday. That’s a hearty chopsuey right there. Beautiful! Looks like your garden is raring to grow. Fig tree….lemon tree in your garden? Sounds like a cook’s paradise. I’m jealous!!!! thanks for another wonderful blog. i love your food photos. Looks good. I’m curious: if you use “whatever vegetable that’s in season”, what identifies the dish as chop suey? The sauce? Thank you, Dan, for writing. Filipino-style chop suey is a hodge-podge of vegetables stir fried in salty-sweet sauce made from soy sauce and fish sauce. Carrots, cabbage, cauliflower, celery and snap peas are traditionally used. I make the dish with whatever vegetable is in season. I love this post Jun. It makes me so happy, knowing you guys are living in a beautiful place full of the seasons bounty. The girls must be over joyed. I have to admit I am a wee bit jealous that you get to get your hands dirty so often. Having somewhat of a garden space is what I wish we had, then our place would be near perfect. I am also jealous that you have a fig tree. And blackberries. If you need help canning this year, just whistle. Maybe a canning party! I don’t have shrimp stock. 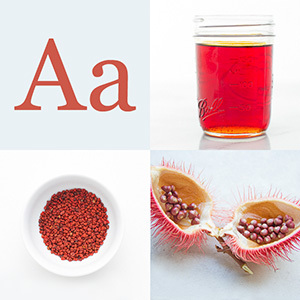 Is it easy to make or buy somewhere, or is there an appropriate substitute? If I leave it out, will it change the taste dramatically? This looks delicious, and I think my son would love it. Cheryl, thank you for writing. Shrimp stock is easy to make. Place shrimp heads and trimmings in a pot and add water, enough to just cover the trimmings, about 3 to 4 cups. Bring to a boil, reduce heat and let it simmer for 15 minutes, stirring trimmings occasionally. Crush heads with a wooden spoon to extract the flavor. Skim and discard any foam that rises to the top of the liquid. Strain the heads and shells. Or you can use chicken stock instead. In place of shrimp you can use chicken breast. Boil chicken breast until cooked, shred the meat, and stir-fry it with the vegetables. Love qual eggs! My mom adds them, too. Thank you, Jennifer, for writing and for the book recommendation. I’m going to check it out.